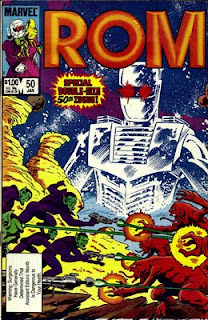 Today we look at ‘Rom’ #50, Bob Harras was Assistant Editor at the time, covering for the “absent” Editor Ralph Macchio (no relation to the ‘Karate Kid’ actor). Harras has had quite a storied in the comic biz, working as a writer and editor for Marvel, DC and Wildstorm. He was Marvel’s Editor In Chief from 1995-2000 and currently holds that same title at DC. For those who may not remember, Rom the Spaceknight was an action figure created by Parker Brothers in 1979(watch a promotional video for the toy here). That same year, the character was licensed to Marvel for a comic book series. The Rom toy wasn’t a success and Parker Brothers abandoned plans for more “Spaceknight” characters. But the Marvel series continued after the toy was forgotten, running for 75 issues, the last one cover dated February 1986. Rom's greatest foes throughout the series were the Dire Wraiths, a race of shape-shifting aliens. The Wraiths invaded Rom's home planet Galador. They were driven out, Rom pursued them across the universe, eventually following them to Earth. Almost every issue was written by Bill Mantlo and most were penciled by Sal Buscema. The series featured guest stars such as the X-men, Sub-mariner, Power Man & Iron Fist,and Alpha Flight. In addition to the Wraiths, Rom's villains included Galactus and Mystique's Brotherhood Of Evil Mutants. For more info on the series, please visit the excellent 'Rom, Spaceknight:Revisited' tribute site. 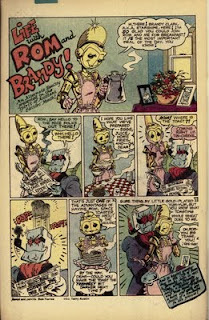 Rom’s supporting cast included Brandy Clark, who was one of the the first Earthlings to befriend Rom. By AEM, Brandy was wearing the armor of Starshine, a fallen Spaceknight. She became Rom’s partner in his war against the Dire Wraiths. 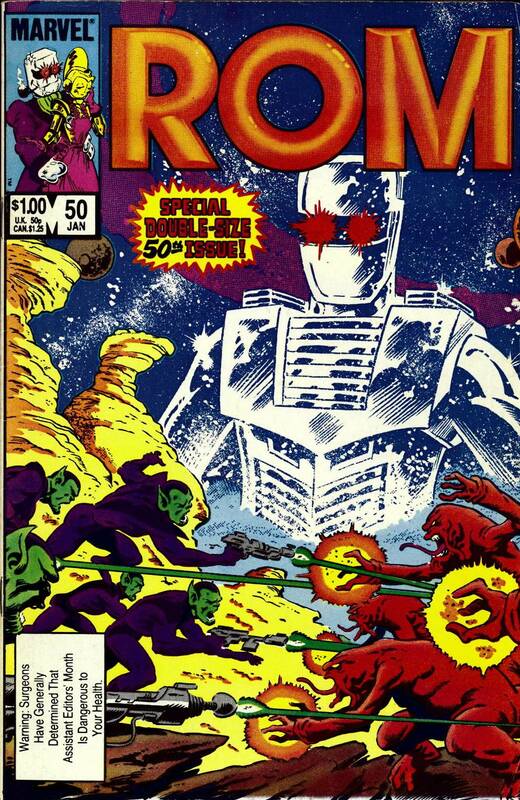 Rom #50 was double-sized , and featured a war between the Skrull Empire and the Dire Wraiths, with Rom & Brandy caught in the middle. A good story, but it contained none of the weird/quirky stuff associated with AEM. On the cover at the top of this post, you’ll see the AEM “Warning label” and the cover corner features a cartoonish drawing of Rom(in a smoking jacket) and Brandy(in a housecoat). 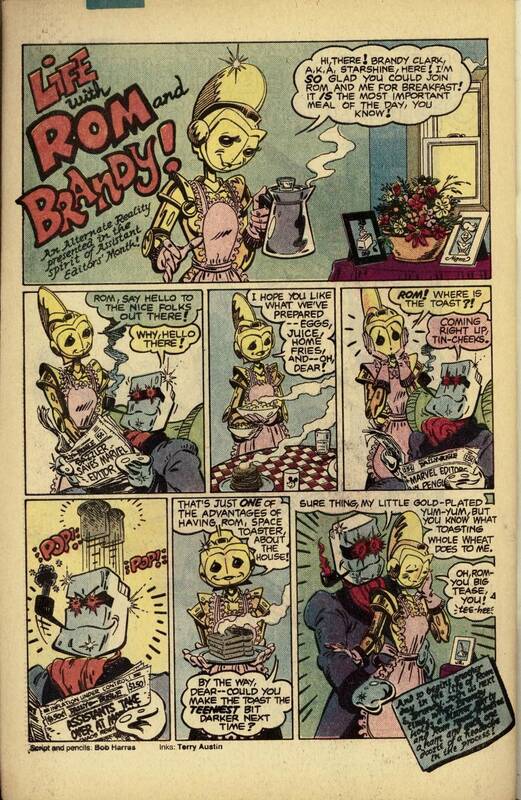 Upon closer inspection, you'll notice that the headlines on Rom's newspaper change in every panel. The first headline references a 'Dazzler' story that also featured an appearance by Harras(we'll get to that story in another post down the road). That's very meta, even by the standards of AEM! Thanks to Bob Harras and Terry Austin for giving us a laugh! In our next installment:George Lucas invades AEM! Nicely done. I've started a page (still unpublished) on AEM, but haven't had time to work on it much. It's not going to be nearly as in depth as this. I look forward to more, yet am sad that each one means the blog is another step towards being finished. Thanks for stopping by Lee! I hope everyone who hasn't checked out Lee's Rom site will do so now, it's one of the best comic sites I've ever seen. I wish rights would get worked out so we can get a Rom Masterworks or some other high quality reprint book. I was lucky enough to have the Rom toy as a kid, I always liked it even though it was a bit goofy looking. Since he was a Marvel character, I used to have him interact with my Megos. The day the Neutralizer broke was one of the saddest moments of my childhood! Great site, great subject! I loved AEM so much I devoted an entire chapter of my book, Deus ex Comica: The Rebirth of a Comic Book Fan, to it! I've got just a couple of years on you, so we're coming at this from very similar places. I'm really enjoying your blog and reliving these fun issues again. Nice work! AB, thanks for commenting and thanks for letting me know about your book! I'd never heard of it, I've got a birthday coming up, I'll add your book to my wishlist!